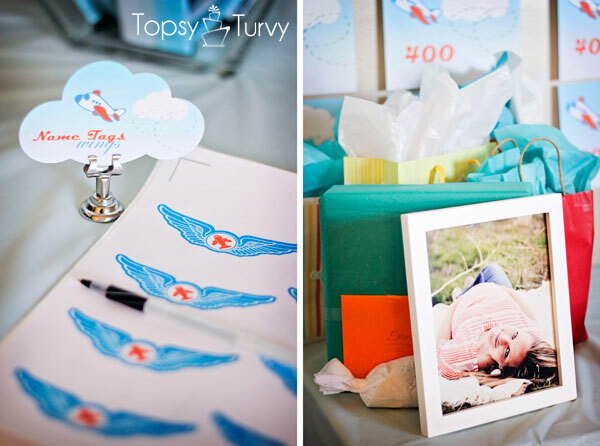 Now for the full Airplane Baby Shower Reveal! It was SUCH a fun party to plan and throw, and so much fun for my sweet cousin to come into town so we could all love on her and be happy for her upcoming baby! Again- we went with the Airplane shower because her Dad worked as an air traffic controller and her husband works for Delta, so lots and lots of flying are in this kid future! We designed the table to look like grass on either side of a runway… and I love how the table turned out! I wrapped a few of my puzzle boxes in green wrapping paper to add height without sticking out. and peanuts! This way people could snack at the party, or take some home as well! I found these great clam-shell plastic food containers at Gygi’s here in SLC, but I’m sure a local food/restaurant supply store would have them, or of course ordering online! We made chicken salad sandwiches on croissants and I love the addition of my stickers too them. I’m still tickled how it all came together! 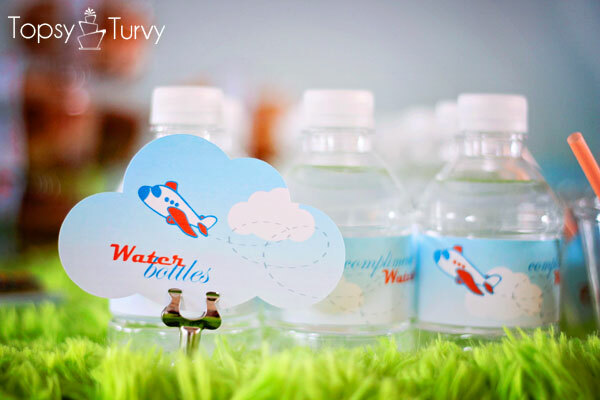 And you can’t have any party, let along an airplane party without bottled water (get all the free printables for the airplane baby shower here)!!! I also found these plastic cups, the same ones from the airplanes, for the Orange juice (my favorite airline drink, AND the perfect color for our party). BUT I couldn’t find the right size lids… NEXT time, right? 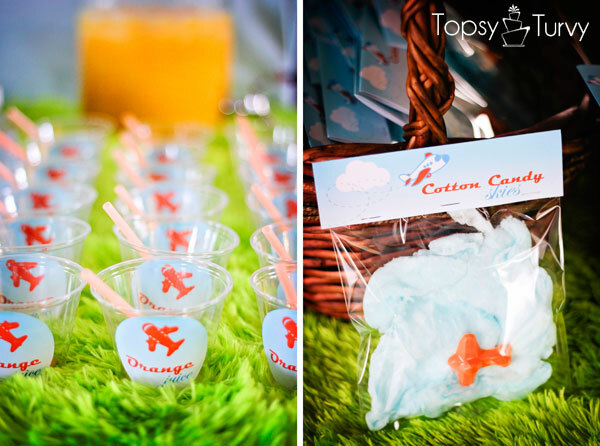 And with Easter the next weekend I found an abundance of blue cotton candy, so I made these orange planes with a mold and added them to the bags! 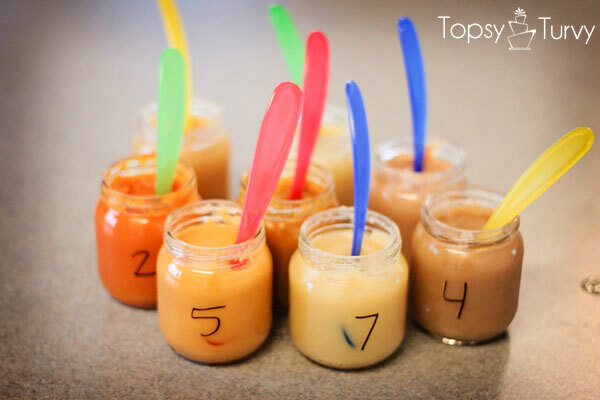 And the baby food game, the winner of this one was my 17 year old cousin, she babysits alot!!! Way to go! 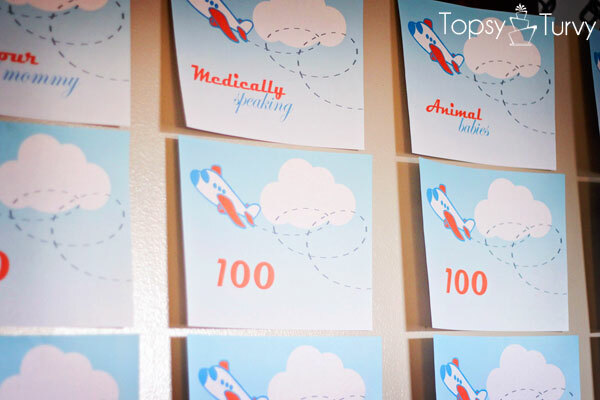 And finally a reminder of the airplane invitations I created for the party! It was a wonderful evening and I hope my sweet cousin had a great time, cause in the end that’s the whole point of throwing a party! Thanks so much! 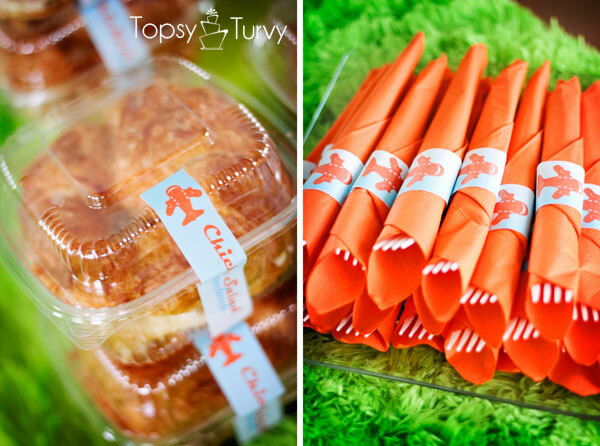 When I saw that orange was the pantone color of the year it seemed like a great base color for the party! this is too cute! everything is so awesome! great job on everything! Thanks so much! It was a really fun party to design and throw! Love the idea for the jeopardy game. 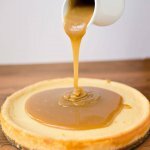 Any chance I can get the questions/answers that you used? I’d love to do this for my friend’s baseball themed shower I’m throwing at the end of the month. My sister was in charge of that game, I’ll ask her for a copy! It was super fun! Any chance you can send me a copy of the jeopardy game q&a’s also? 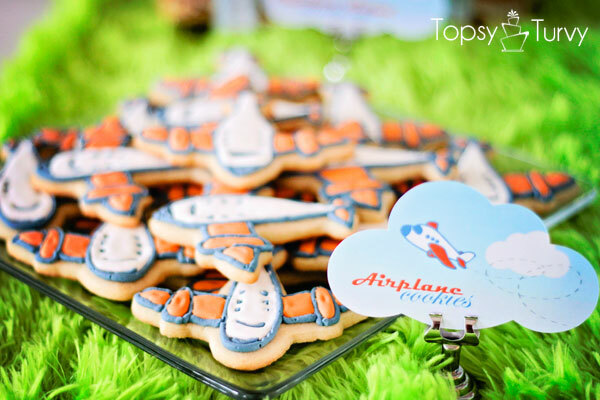 We’re having an airplane themed baby shower, too, and this sounds like so much fun! Thanks for posting and sharing. Such a cute shower. Go to the printable page and click on the Jeopardy game pdf and the questions are there. Beautiful and so creative! How did you make that grassy field? Tissue paper? It was actually two fuzzy blankets from walmart! Is there anything cutier than clouds on a stick? I love it! 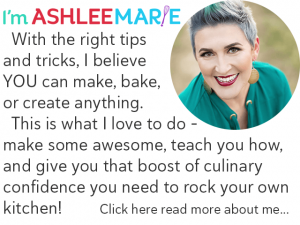 All your ideas are so great Ashlee! I love the cloud cake pops too! Thanks so much! The cake pops were a HUGE hit, they usually are! Awww thanks! I’m in love with how it turned out myself! This is so awesome. Love the colors and the uniqueness of it. 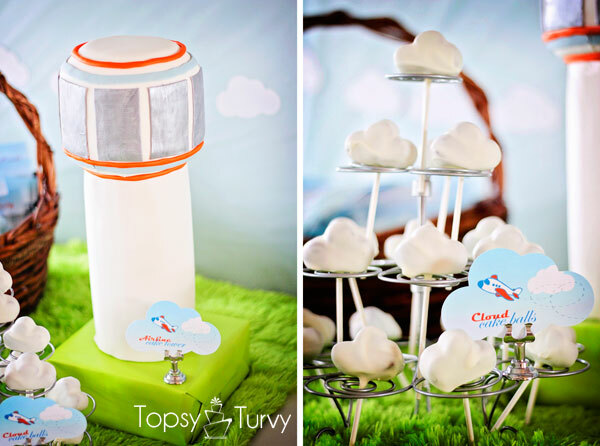 The control tower cake and clouds are wonderful. Thank you so much! 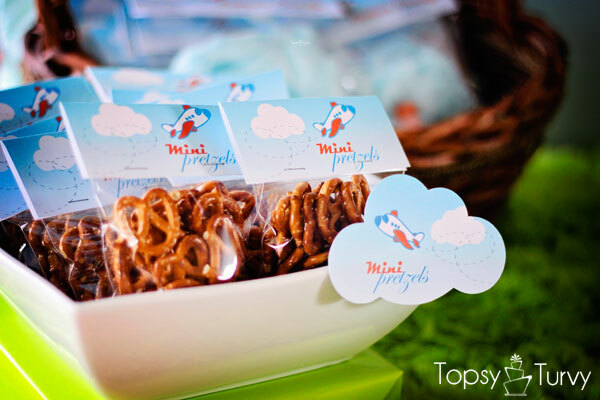 I love designing and planning and creating parties! Those invitations are too cute. You did an awesome job. I’m sure it was a blast. The cake pops look yummmyyy and what a fun but appropriate theme. Thank you so so SO much! It was a wonderful party! Looks like a fabulous party. Thanks! I think it went really REALLY well! Thanks! I enjoy planning as much as I enjoy putting it all together! I spent the last few months narrowing it down and designing it all. It was a BLAST! I’m asking my sister for a copy and then i’ll email it! For my husbands 30th I have got him a flying lesson so shall be utilising some of these ideas thanks. How totally fun!! For our anniversary a few years ago I wanted to sky dive, but it didn’t work out. Honestly I’d probably enjoy flying lessons more than my husband (he has height issues sometimes) but what an amazing birthday present! Let me know if you need anything from me! 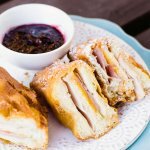 Thanks so much for the feature!!! 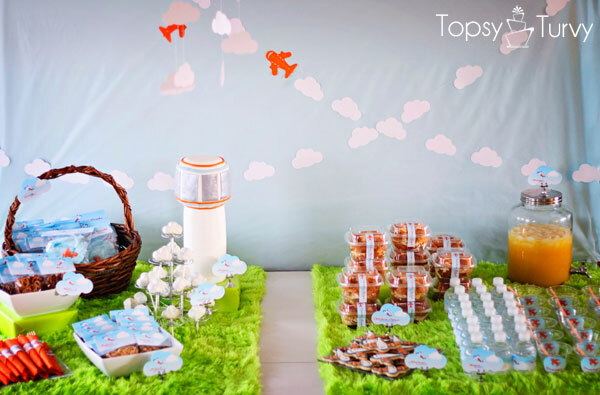 I loved creating this party for my sweet cousin! And it’s so fun when other people get to enjoy it too! WOW!! I’m such a sucker for airplanes. Little Man’s bedroom is all airplanes. This is just plain incredible! Love every little detail Ashlee! I’m so glad you liked it! It was such a fun shower to throw! Airplanes are so much FUN! If you lived closer I would have dropped of the cloud/plane mobile when I was finished! What an adorable party! 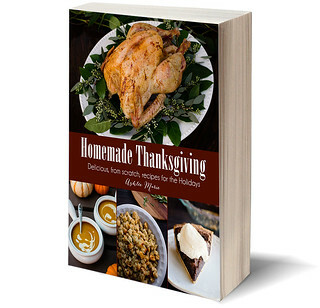 My favorite part is the airplane food! Thank you! 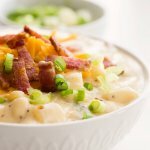 I love the airplane food too! 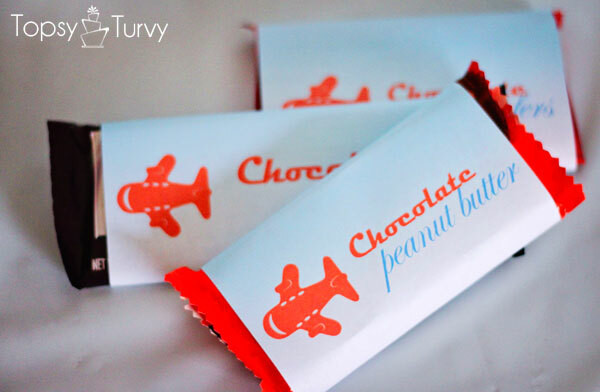 When I was debating themes the idea of doing the airplane food is what tipped the scales for me! This is crazy impressive! My son loves airplanes (in theory, in reality he is miserable when actually in the air! 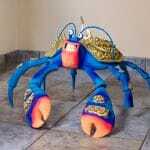 ), so this would make a really cute birthday party for him. Thank you!!! 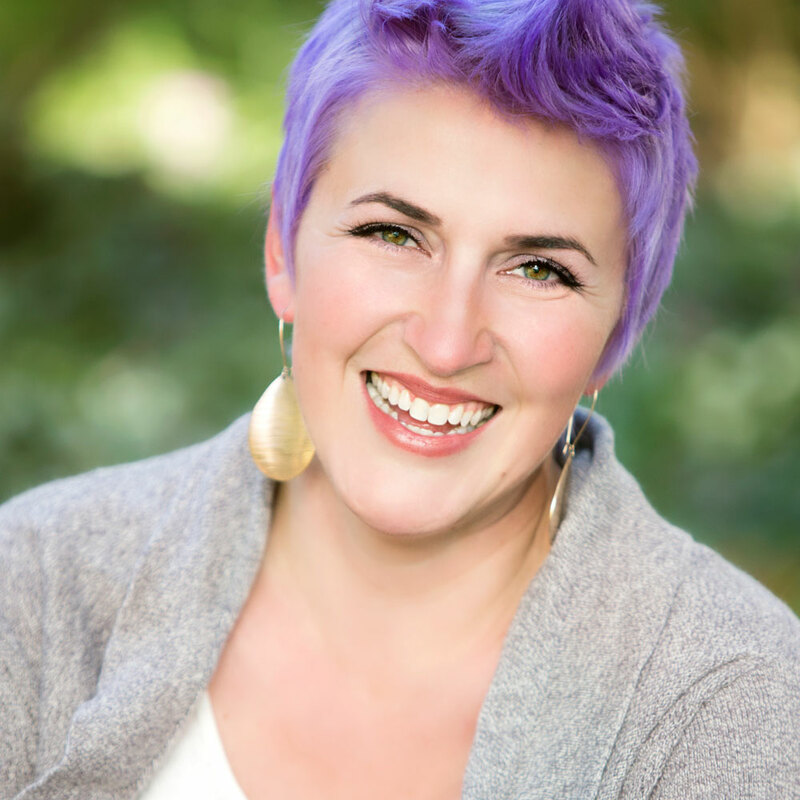 I loved creating it, and airplanes are SO much fun… of course I love flying in them though! hopefully as he gets bigger it gets easier! I’d love a copy of the jeopardy game as well. We have tons of showers in our area, and that one has never been done! I’ll see about getting a copy of it! 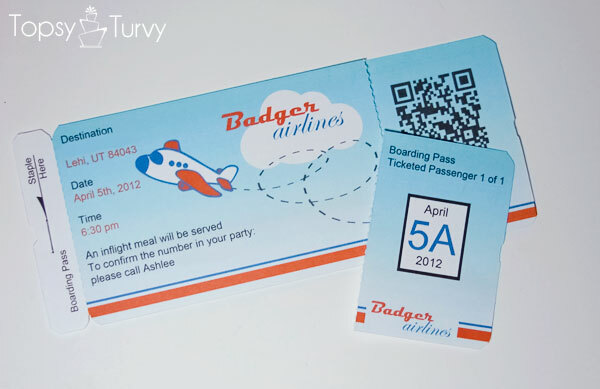 I’m interest in the boarding pass invitation, how I can get it. I just got a working computer and I’m working up getting out printable’s so you can make your own. I would LOVE a copy of the game also, please!!!! those name tags are great! they are perfect for an even our research foundation is throwing. where can i find them?? thanks so much! I made them up myself, and cut them with the silhouette. I haven’t had a min to share them yet. when is your event? It’s on “the list” GAH! 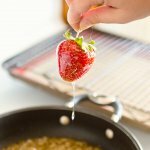 I am so far behind, I have a list of 125 posts that need to be written right now! It’s INSANE! When is your party? I’ll bump it up the list a bit! Well the shower’s in Jan, so I was thinking about working on them this week or next. I don’t want to rush you at all, so I’ll just wing it! Thanks so much for being willing though! are you wanting everything? or just the blank invitations? Well, all of it, but I suppose I wouldn’t need the other printables for until after Christmas – but please, don’t rush anything for me – I just wanted to check. 🙂 Thanks so much!! Would you post a copy of the Jeopardy game? I’ve been looking for game ideas that are less traditional and more adult. This looks perfect. The whole party looks amazing, btw. Super cute, cohesive, and very well put together. It just looks FUN. I’ll see about putting something together. 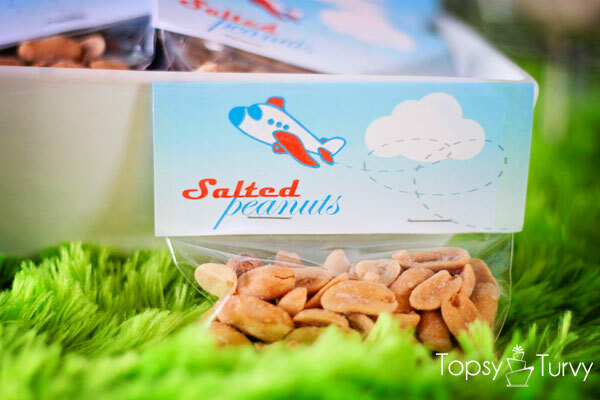 I’m throwing my sister an airplane baby shower next month and I LOVE the package of salted peanuts. Where did you find that if you don’t mind me asking? I created all the printables myself. when I get my computer back (in the shop after a crazy wicked virus attack) I’ll get them added! Hello! 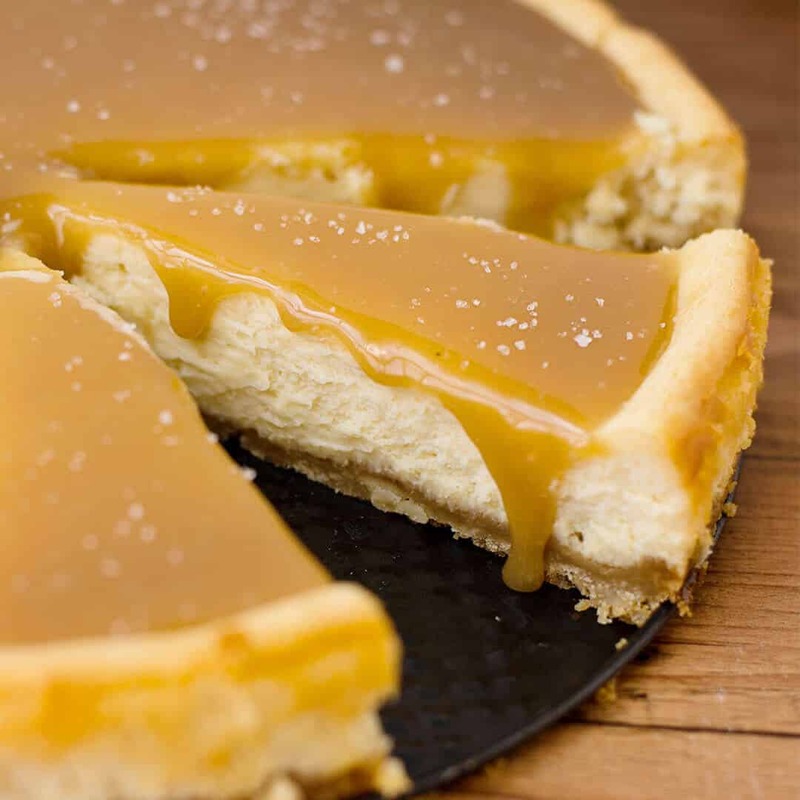 Is it possible that you have added the printables and I’ve missed them? I’m giving a shower this weekend and would love to use some of them. Also, where did you get the information for the jeopardy game? Like, questions and answers? I’ve looked online but am having a hard time finding a good set. Thank you! i love the invitations and printables too! if you did post them somewhere or wouldn’t mind sharing, I would love to use them for my boy’s 3rd birthday at the end of the month. I’ll work on getting them up, they turned out so cute, but I’ve been so busy I keep forgetting to get them up. I’m sorry, I still haven’t added them. there is always so much to do. I bummed it back up my to do list. I’m so sorry. Would you mind sending me a copy of the Jeopardy game? (sunflwer1838@yahoo.com) I’m throwing my friend an Airplane themed shower in a couple of weeks and this will be a perfect game to play! GAH! I have not. I’m not sure how to share them as they have not shape as a printable, it takes the silhouette software with the specialty shape I created to cut out the invitations, and the planes and clouds are custom made silhouette studio shapes… I was hoping Silhouette would carry the shapes for me but I haven’t been able to get them to agree. hi! i’m throwing an airplane-themed baby shower for one of my best friends and i love what you did here. i’m curious to know how you created the “grass”? thanks! on the table? it’s two furry blankets I found at walmart! 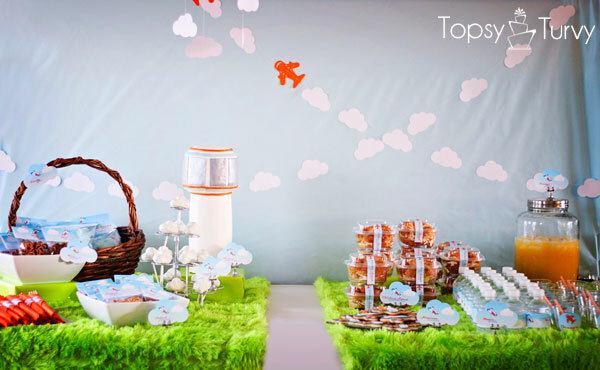 Hi, do you have a picture tutorial for the cake pops clouds? I love them!! Thank you! I don’t! I’ll put it on the list to make a tutorial for them! thx for inquiring! I never know what food items people are going to get excited about!